Join us for this fun 10-week program and make a terrific sampler quilt! The Sampler Block Shuffle is a FREE series of 30 blocks from Moda's great designers. You can make your blocks using a Layer Cake, a Jelly Roll or even your scraps! We have a special Tula Pink Layer Cake available just for this program! See our shop samples below, using Tula Pink prints with Kona "Snow" as the background. 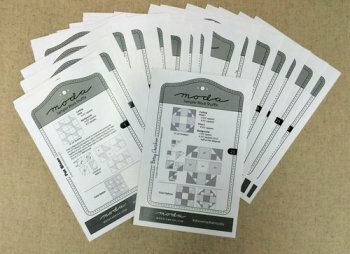 If you like to plan ahead, you can download Moda's Inner Border Pattern and the Finishing Instructions for the quilt, which include fabric requirements, setting design and borders. The finished size is 59 1'/2" x 68".